As Spring makes it’s presence even more known, we look at spring cleaning your online presence. Part two of our Spring Clean Series. 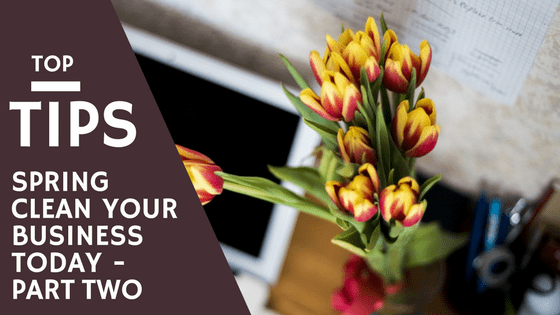 In my last blog post we looked at running a business audit in order to spring clean your business. I would love to hear your feedback on that, because now we are going to look at spring cleaning your online presence. I have recently looked at the importance of being online (Visit the blog post here) but this time we will be looking at how to be consistent online with your brand, and the benefits. There are 3.773 billion internet users, and 2.789 billion of those users are active on social media in 2016 and out of those internet users 1.61 billion sales were made online in 2016. Accessing this audience, and becoming recognisable is important to start making those sales and achieving your financial goals. So how can you be consistent online? Apply your logo to any imagery you use. It does not have to be big and bold, as long as it is clear and recognisable. Software such as Canva, or Photoshop, can assist you in placing your logo on any imagery you use. You can have variations of your logo such as a vertical logo, square logo without writing, or a horizontal logo to fit within the different marketing materials, as long as the logo is the same content. If you haven’t already, select a collection of colours that ties in with your brand and use them on your website, in your logo and even in your imagery. For example for RedRite, red is the prominent colour which I try to use in my logo, and in the floral images I use by selecting red/pink flowers. Talking about images, make sure the ones you use relate to your business. If you sell clothing, and use images of individuals wearing the clothes, or clothes flat lays, then keep it consistent and use the same type of images on social media and adverts. Different social media platforms do require different approaches on tone, such as professional on LinkedIn and chatty on Facebook. However, you can still keep the message of your business consistent. Think of a singer, whether they are singing a ballad or something more upbeat their voice is recognisable by their audience – this is what you want. Keep the language the same, just apply small tweaks to the tone in order to match your business. If you brand is happy go lucky yet using LinkedIn as a platform, you can keep your posts light-hearted while still being professional. Keep your business name the same – seems silly but I don’t just mean your actual business name but also the usernames you use. When setting up a social media account check that the username you use on other profiles is the same. If it is not available do not pick something off topic, just insert a ‘_’ instead or ‘-‘. This keeps it as consistent as possible. Content is not just the words you use but also the font you use for those words. On social media you are of course limited to the fonts of the platform. However, for your website and marketing materials, eve your logo, it is possible to mix up the fonts you use. Select 2-3 font families that you can use throughout all platforms. If you use a decorative font in your logo then, select third less decorative font that compliments it for use in written content. A big question I see a lot online is whether or not to have the same posts posted to different platforms at the same time. The answers are always mixed, my opinion is that to be consistent you need to share the same content throughout all your platforms, not necessarily allposted at the same time in the same way but yes you need to post the same things. Use the same imagery but change the tone of the message to match the platform, such as Twitter – make it sharp and witty but to match the same message you have expanded on in Facebook. If your imagery and content is not on brand then start to make the changes to match them up. If needed hire a designer to create your perfect logo in various formats so it can be used in all the ways you need. Create your brand colour board, with related image themes you wish to use, add the font families you want to the board as well. Then keep this file somewhere safe so you can relate back to it whenever you feel you are losing focus. The benefits won’t be noticed overnight but the longer you stick with consistency the more your audience will start to recognise your brand and therefore take notice when they see you online. If you need help taking these first steps I offer a 1 hour free consultation where we can go over what you currently have in place and how to change it. Email me to day to book in your consultation.